I do realize this is a New Years Party and it’s a little late for New Years inspiration! But this color combination and styling could be used for other events. I just love the black and white patterns with the small touches of color. The vase of sparklers adds such a charming little touch. I think this would be perfect for a modern bridal shower or adult birthday. What do you think? Special thanks to Pauline for sharing her glamorous Black & Teal Bash with us! 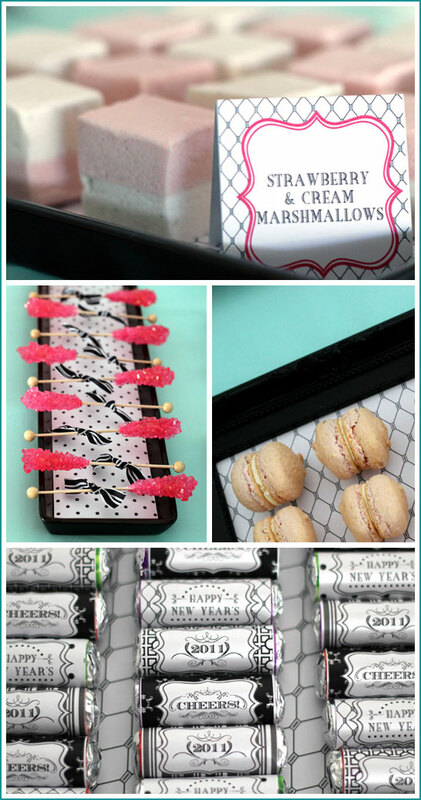 Now hop on over to Sophisticated Yum to get the full scoop on this party! Are those paper fans on the walls? They’re cute and different from the pom poms that seem to be popular! Love the colors! Love all of the different black and white patterns! The pop of pink creates such a nice contrast. I love the rock candy! Love this and using the black frames as platters is genius!